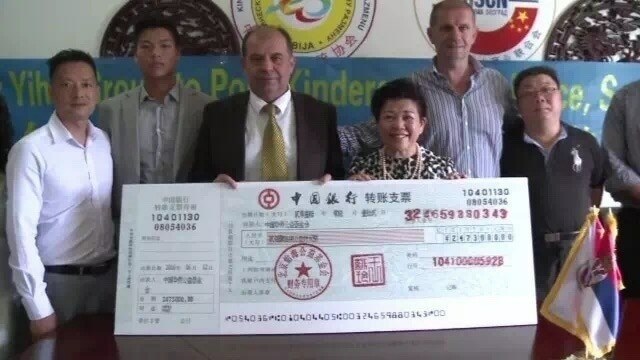 Linda Wong, Chairman of Yihai Group based in Beijing, has donated 300,000 euros ($334,860) to finish construction on a kindergarten in Užice, Serbia. The kindergarten was started 6 years ago, but never finished because of a lack of funding. Ms. Wong serves as the Honorable Chairwoman of the China-Serbia Culture Exchange Association and the donation was part of an ongoing relationship between China and Serbia that began 35 years ago. In 2015, Ms. Wong led a Chinese delegation of 30 officials to Serbia to establish a partnership between the cities of Harbin in China and Užice to deepen the cooperation of "one belt one road" strategy that will contribute to co-development in economy, education, high-tech, culture, travel and public services. She visits Serbia frequently seeking out investment opportunities, information exchange and trade cooperation. In presenting the check at a ceremony held in Belgrade, Ms. Wong said: "Yihai Group builds and runs private schools in the residential communities we have developed all over China. We recognize the importance of education, particularly early childhood education, so we are pleased to provide the funding to complete this kindergarten in Užice." Yihai Group was founded in 1990 by Linda Wong, an entrepreneur and educator with a passion for philanthropy. Yihai Group engages in real estate development, education management, property services and business investments in China and globally. Ms. Wong is one of the first generations of Hong Kong real estate developers to enter mainland China, Europe and North America. Her global philanthropy program is embedded in the culture of her company.